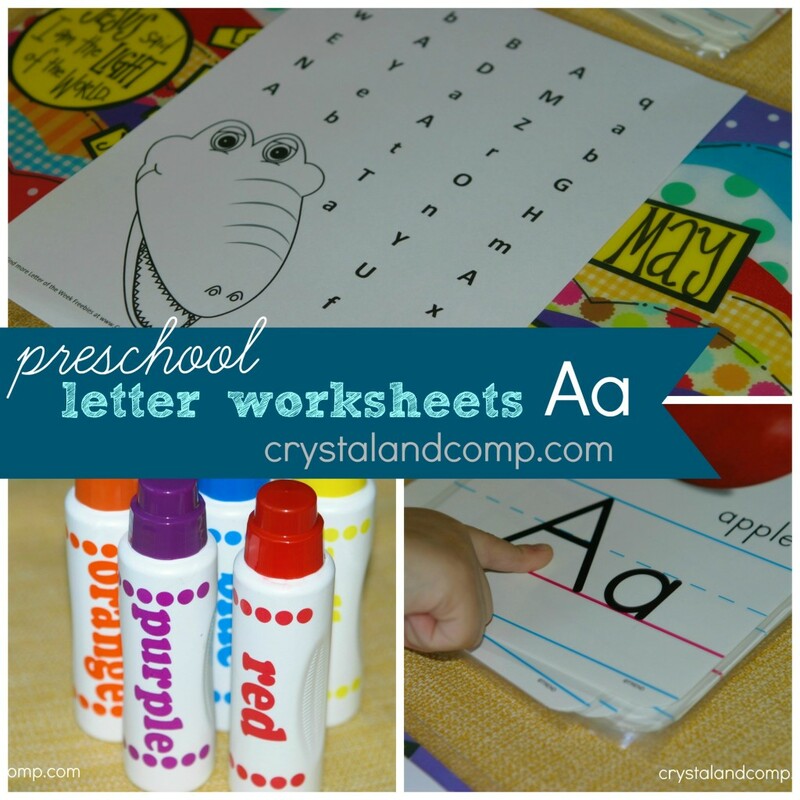 As you work on your letter of the week crafts with your little one, don’t forget to also incorporate our preschool letter worksheets . 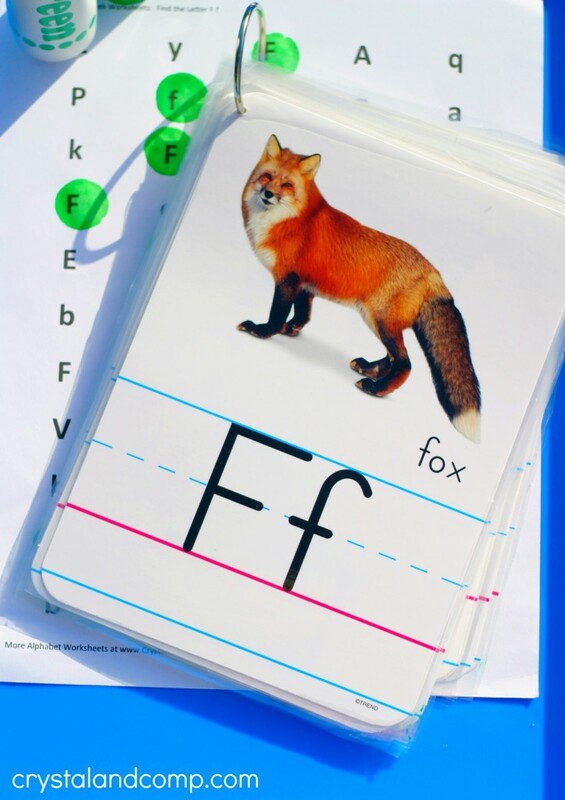 These are perfect for preschoolers and young learners as they work on letter recognition. This is a free printable that uses Do a Dot markers to identify letters and builds fine motor skills. At the end of this post I also share with you many other letter of the week activities you can do with your preschooler as you teach them the letter E.
Print the printable off by clicking the link above. 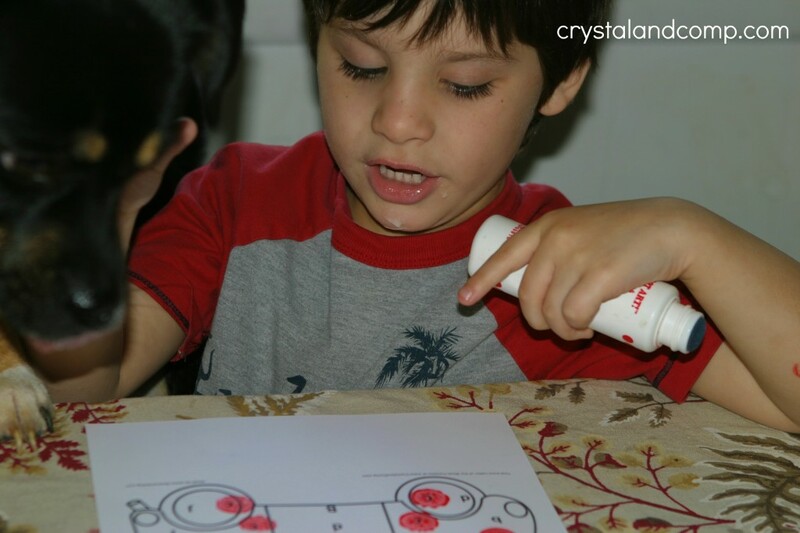 Have your preschooler choose his favorite Do a Dot marker. We chose green. Ask your preschooler if he can find all of big F’s and all of the little f’s on the paper. Have him use his marker to mark each one. You can find all of the little f’s first, or all of the big F’s first or just mark them as you find them. Remind him what the letter F looks like. Trace over the big F and little f with their finger. Ask them to think of all the things that start with the letter Ff. We thought of frog, fox, feather, fan. family, fog and more! 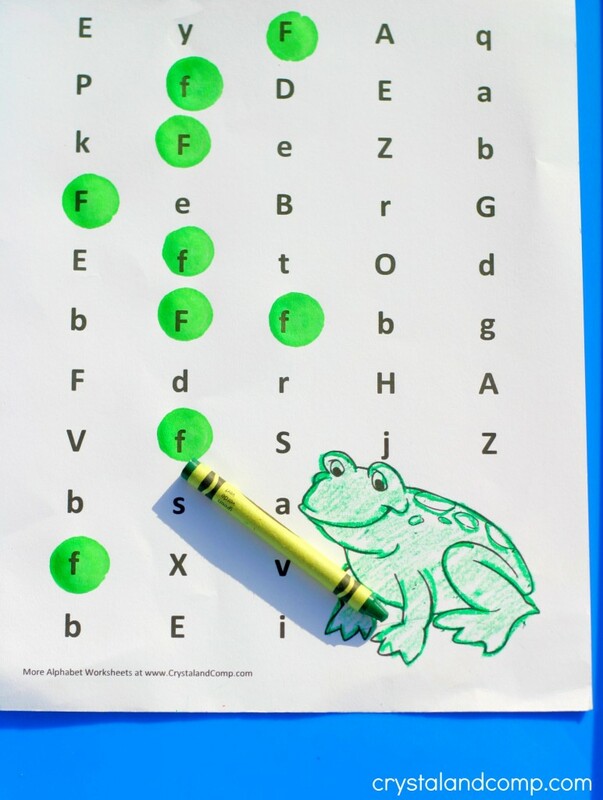 Now you can let your preschooler color the frog. These do a dot printables are simple, but always fun. 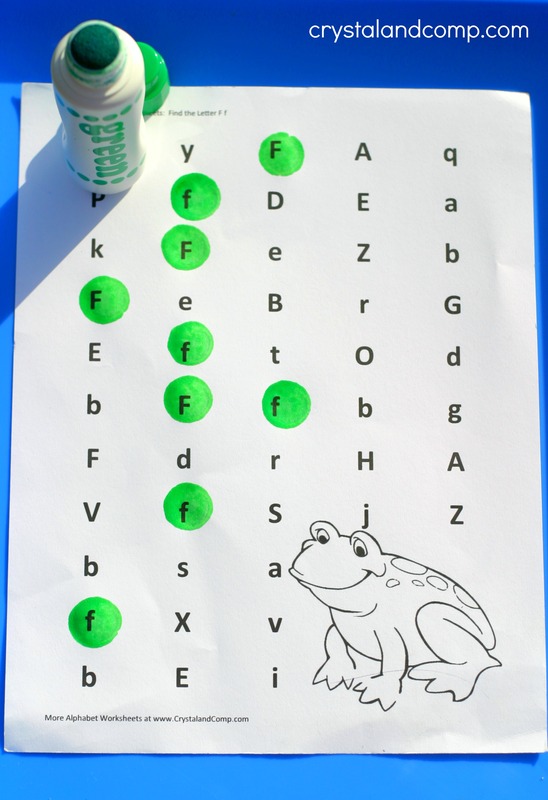 A great learning activity that gives more practice for letter recognition. 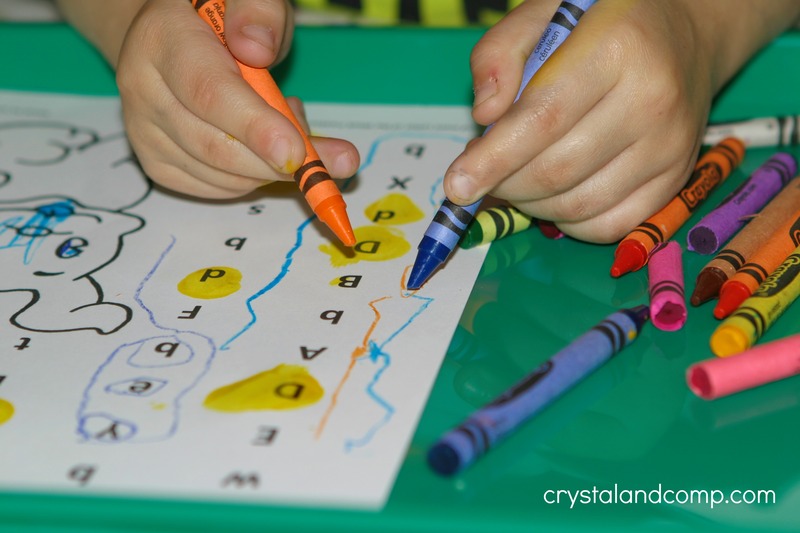 Are you looking for more letter of the week activities to add to your homeschool curriculum? I have tons here! 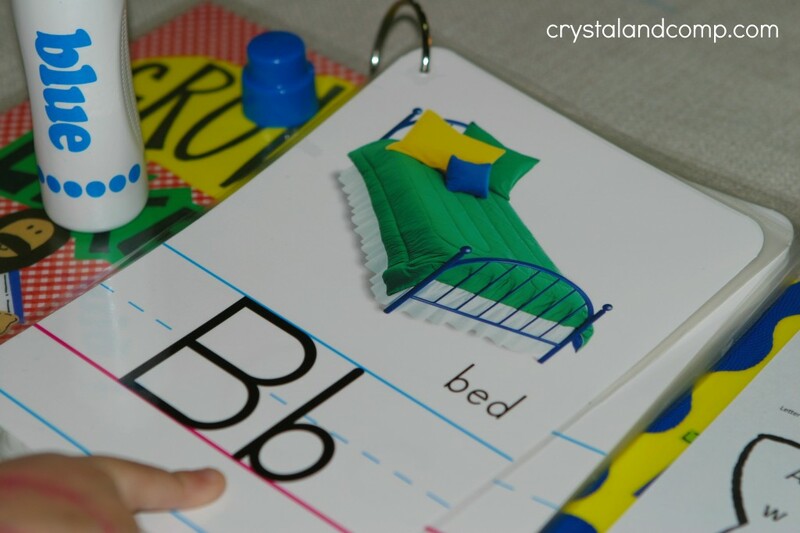 Do you homeschool or do some supplemental learning at home with your preschooler? As you know we homeschool and our little Matthew, who is four, is learning his alphabet. 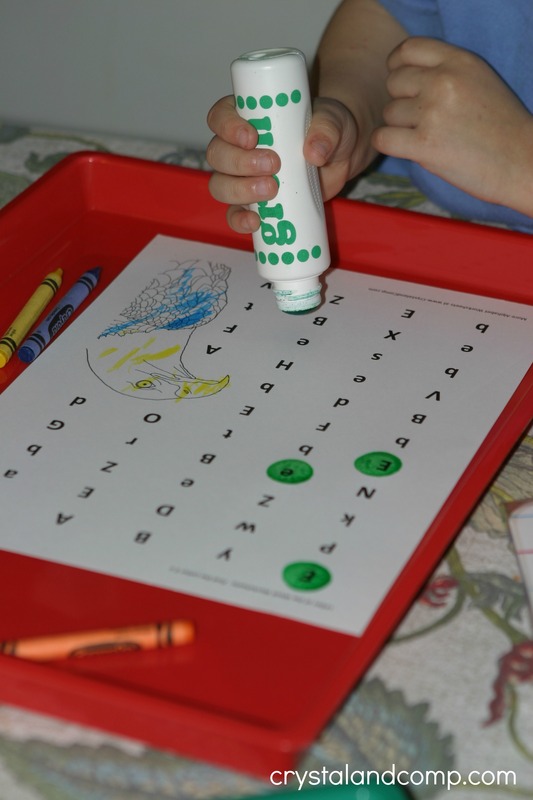 We use these preschool letter worksheets with do a dot markers to practice identifying our letter of the week. We have a lot of fun doing it. 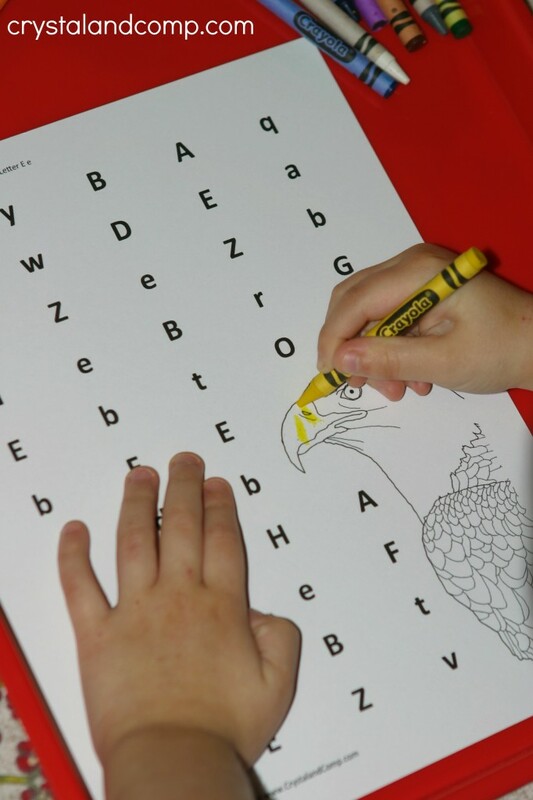 Let me show you how we found all of the E’s for eagle and how we use this printable in our homeschool learning. 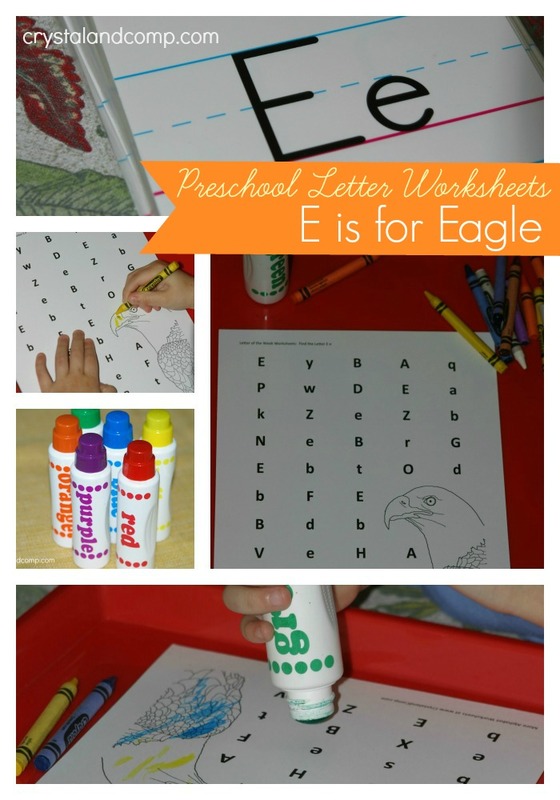 Print out the E is for Eagle printable by clicking on the link above. 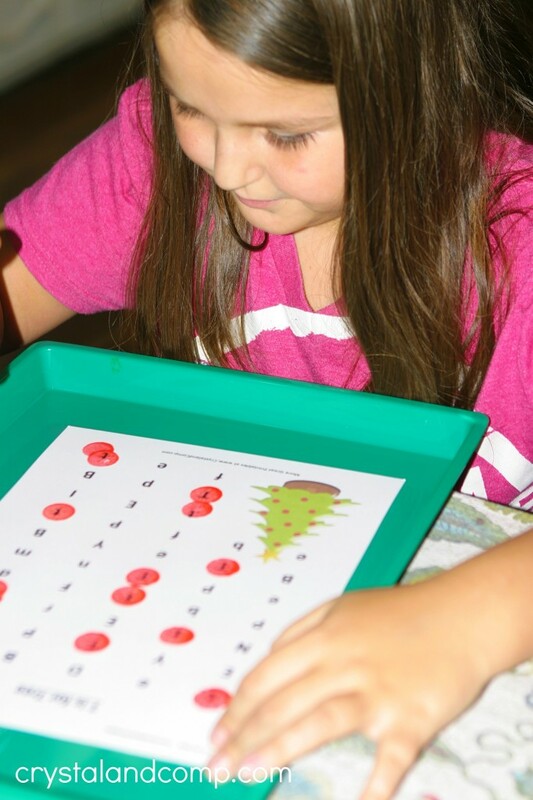 I am really digging these learning trays too. They work really well for keeping all of the supplies together in one place while Matthew is working. 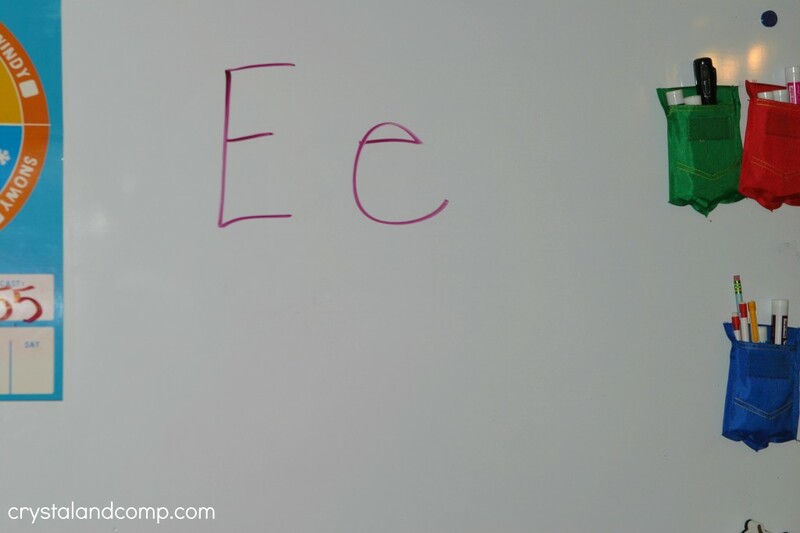 I write a big E and a little e on our dry erase board. This gives Matthew a clear understanding of what the letter looks like. We do all of our homeschool work in the dining room where a large board is hanging to make instruction easier. 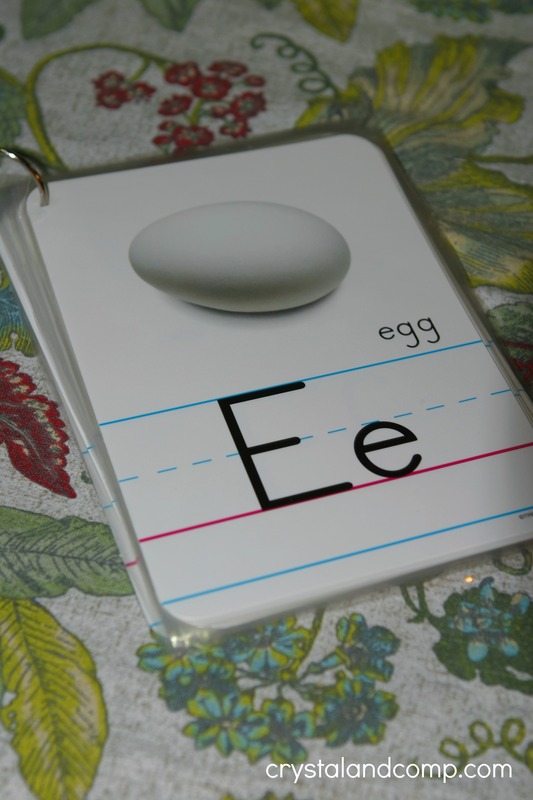 I bring out our homemade alphabet flipbook. We find the letter Ee. We go over what sound the letter makes and trace with our finger how to draw the letter. We name the things that start with that letter like egg, eagle and elephant. 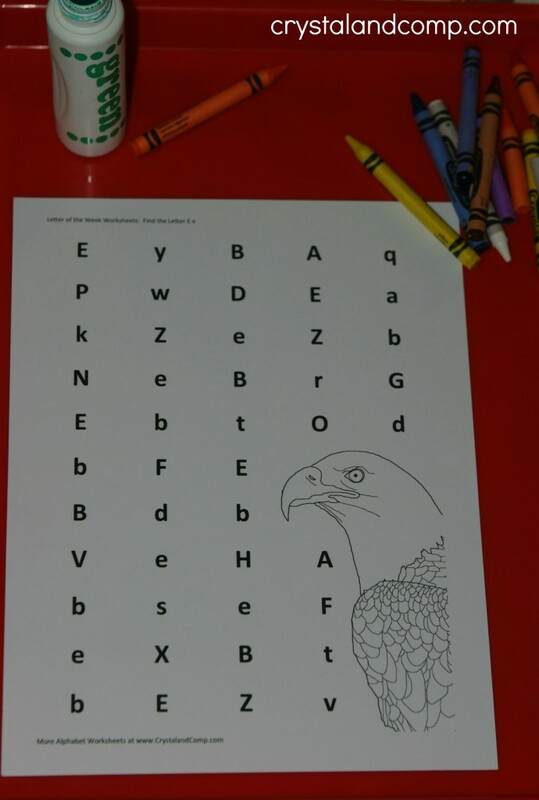 This time I let Matthew decide if he wanted to color the eagle first on the printable or find all of the big E’s and little e’s. He wanted to color first. The he was ready to use his do a dot marker to find all of the Ee’s. He worked hard to mark them all. When he was done he wanted to count them. We also took the time to talk about the color of the do a dot marker he had chosen as well as the colors he used to color his eagle. The possibilities for learning are endless with these and he always has so much fun! What letter of the week are you working on now? 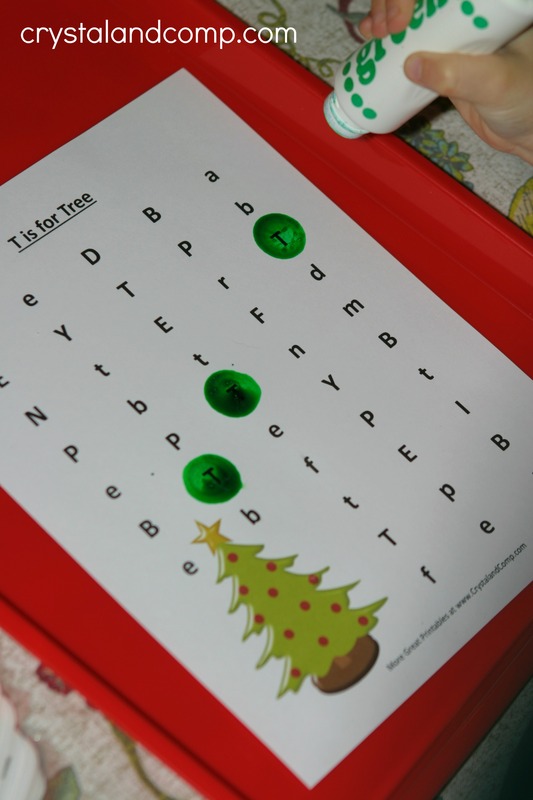 If you loved our packet of Do a Dot Christmas Printables, I think you will enjoy this as well. Matthew always loves when I give him any opportunity to play with the do a dot markers. He loves those things. This past week Matthew (4) and our friend Skylar (my friend Kim’s 9 year old daughter) had fun with this Christmas printable. For Skylar I think it was a fun teaser, she seemed to enjoy it even though she is older. I can see this being a fun warmup activity for an older child. For Matthew, he got to work on the letter Tt. Let me show you what we did. Grab your alphabet flip book and talk about the letter Tt. Notice the difference in the big T and the little t.
Talk about the sound the letter T makes. Talk about things that start with a T, like T is for tiger. 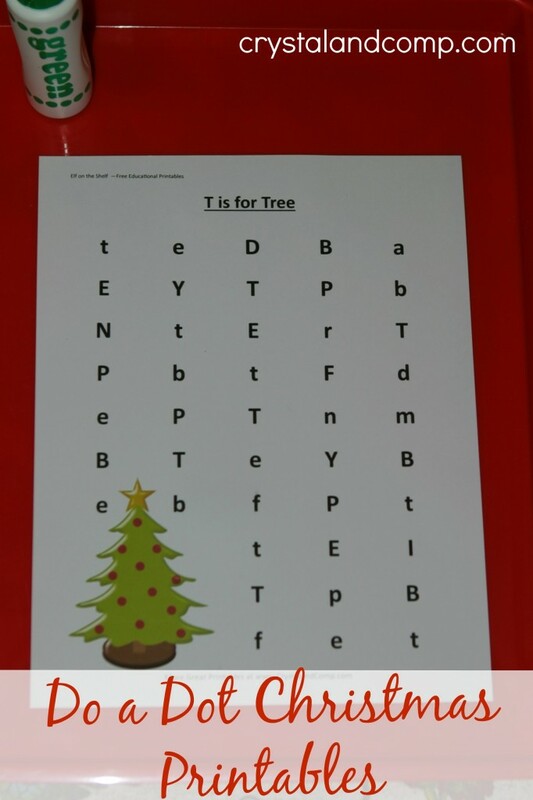 T is for tree. 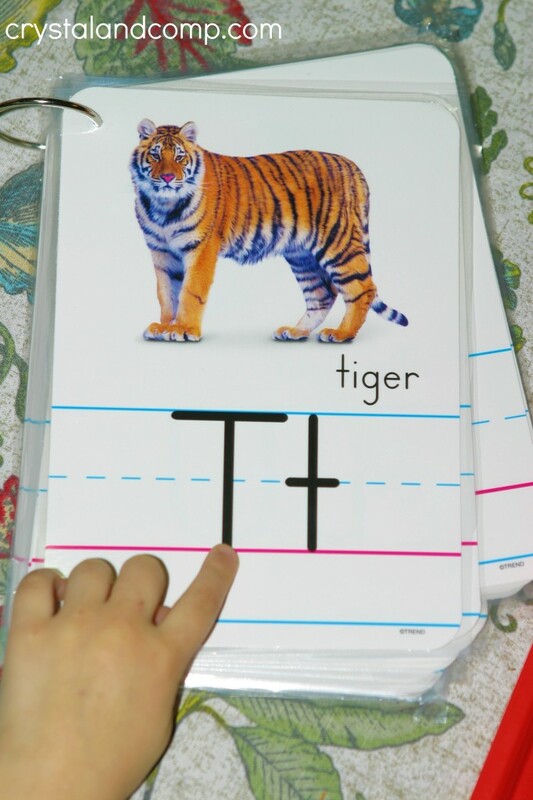 Next, Matthew pointed out all of the big T’s and little t’s on his printable. Then he used one of the do a dot markers to dab all of the big and little T’s. 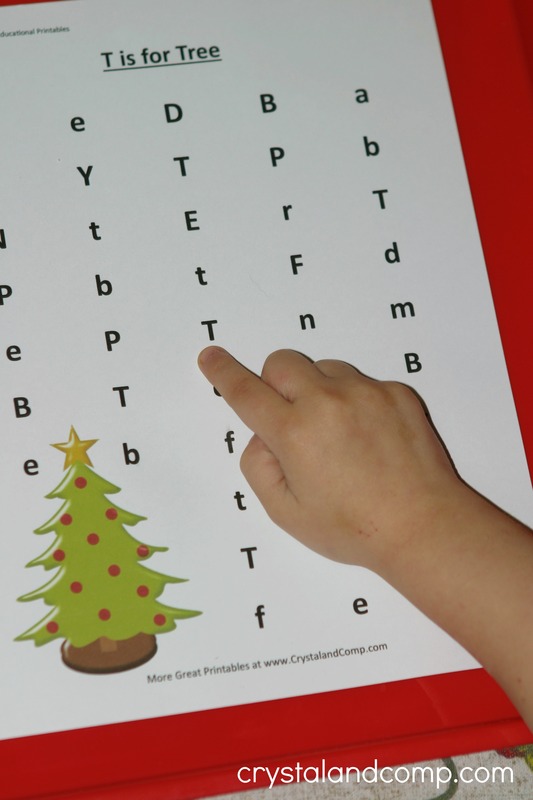 And there is sweet Ms. Skylar doing her T is for Tree printable too! She loves to encourage Matthew to do his school work. We had lots of fun and Matthew learned something. 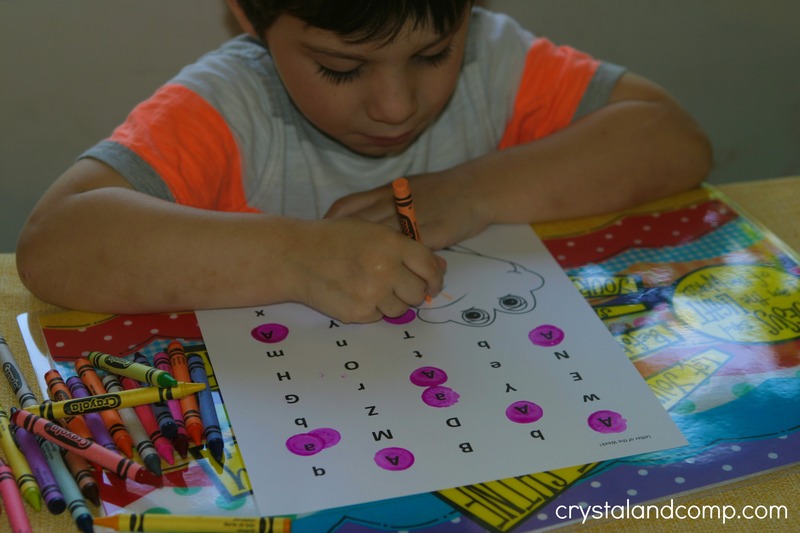 Our preschool letter worksheets are perfect for Matthew (4) as I teach him his alphabet. They allow us the opportunity to tackle a new letter each week. 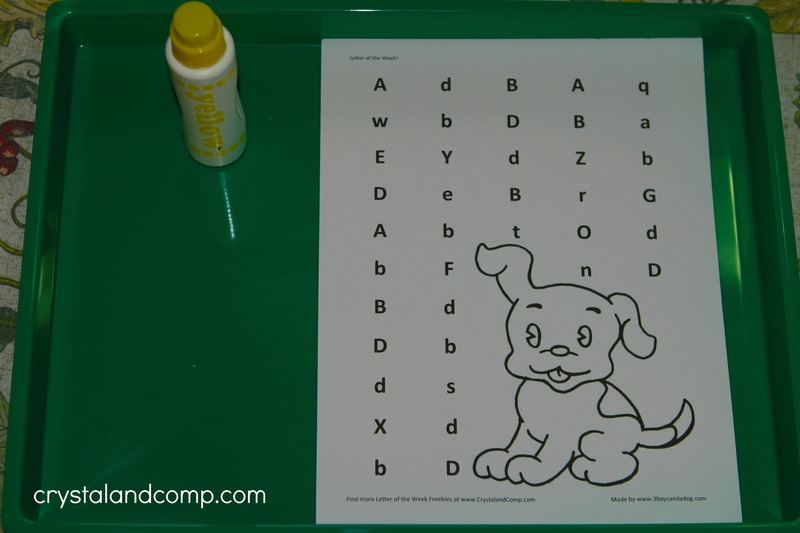 These free printables go well with our letter of the week preschool crafts. 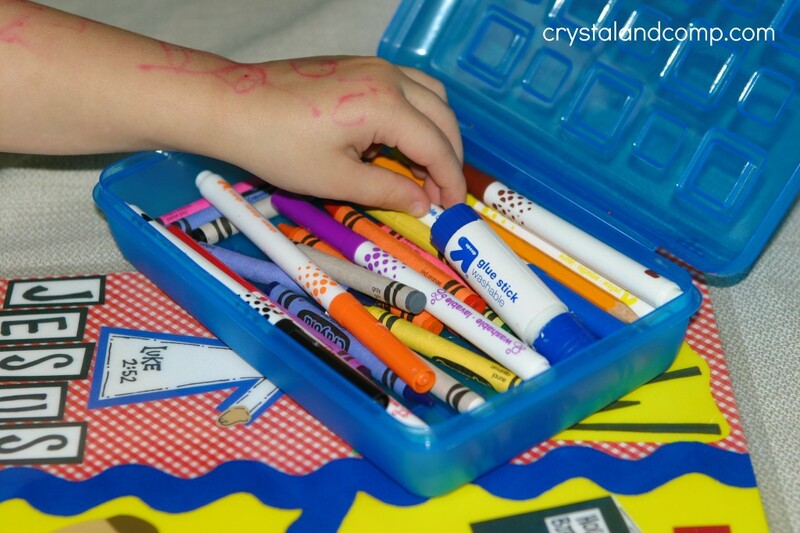 Let me show you how we use these in our homeschool day with Matthew. 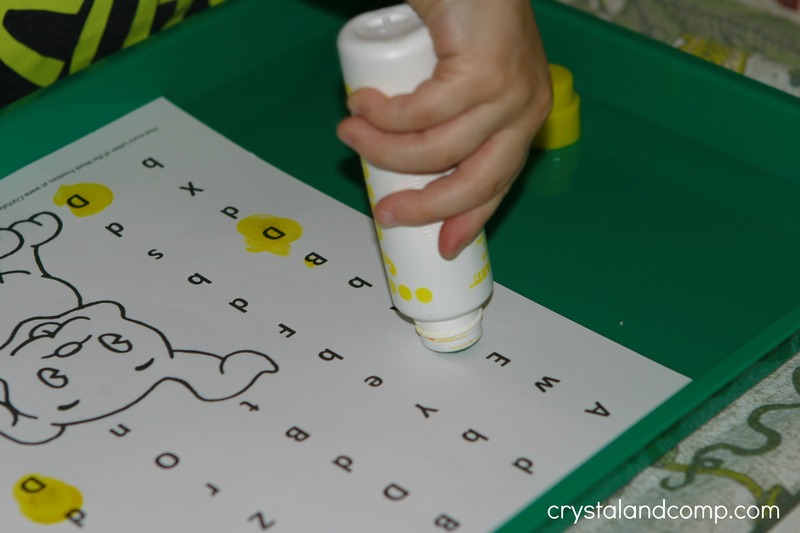 We get our do a dot marker (I let him pick which color he wants to use) and the printable. We identify what a big D and a little d look like on the worksheet. We find the Dd card. Matthew starts use the do a dot marker to find the big D’s and little d’s. 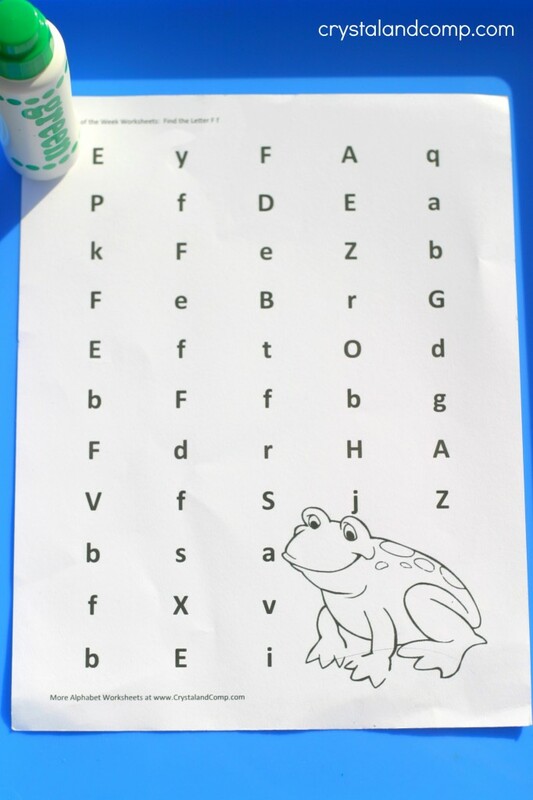 This printable has a a lot of letters that look like D and d. There are P and p, B and b, Q and q. He really confused the little d’s with the other lowercase letters. I reminded him that a little d has a circle then a line. That really helped him. We could go one by one and check them so he was sure not to confuse them. Once he was done marking all of the D’s and d’s, he wanted to count them. Then, he always likes to color the picture on the worksheet. This time he not only colored the picture but pretended the letters like it was a word find like he has seen his bigger brothers do. I just let him lead. 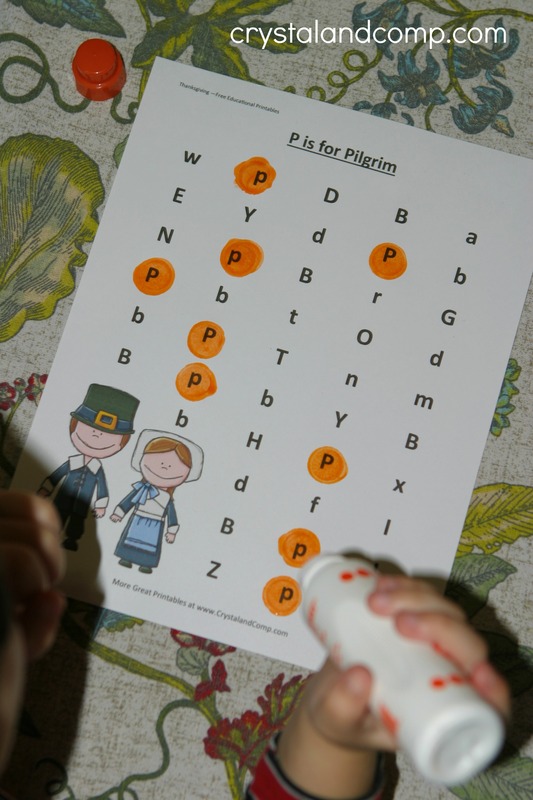 This week we are jumping out of order for our preschool letter worksheets for a fun Thanksgiving do a dot printable that will be perfect for your little one as you discuss being grateful and the story of the first Thanksgiving. Matthew loved doing this today. We made the Pp sound. 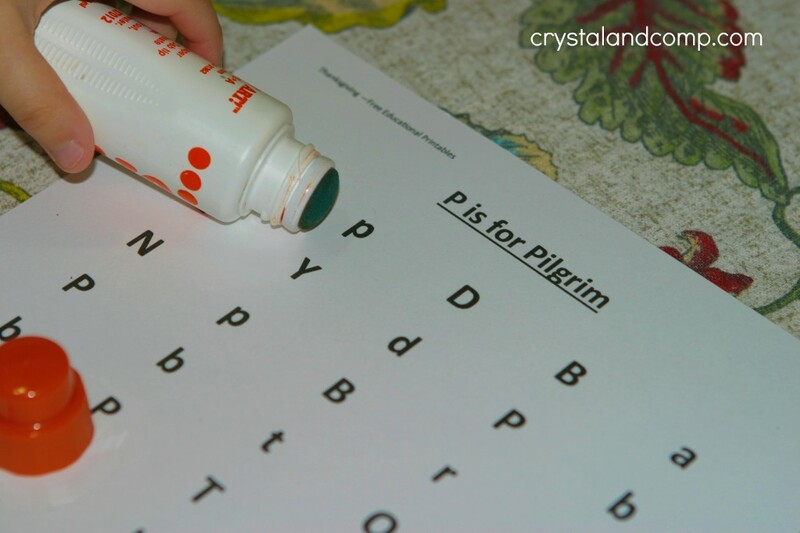 We said P is for Pilgrim and P is for Paint. Matthew used his orange do a dot marker to mark each of the p’s on the printable- both big and small. Then we counted how many Pp’s he marked. Super fun! 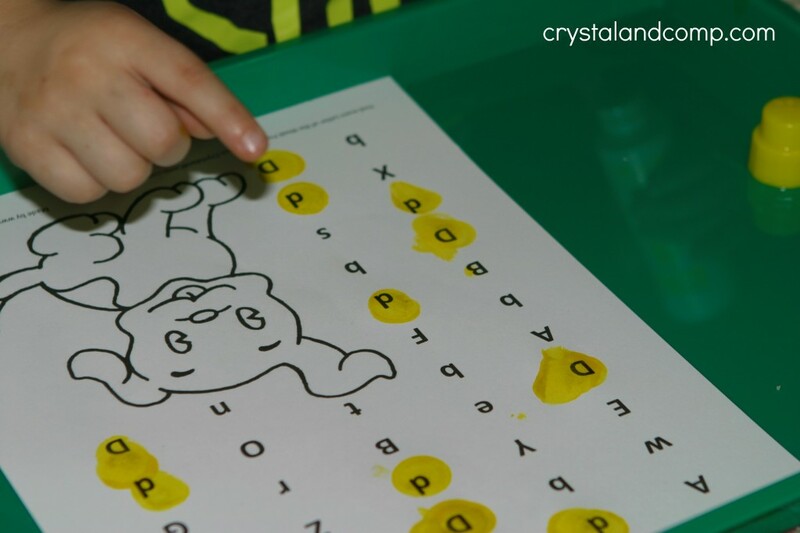 He loves doing these do a dot printables. They really make learning fun! 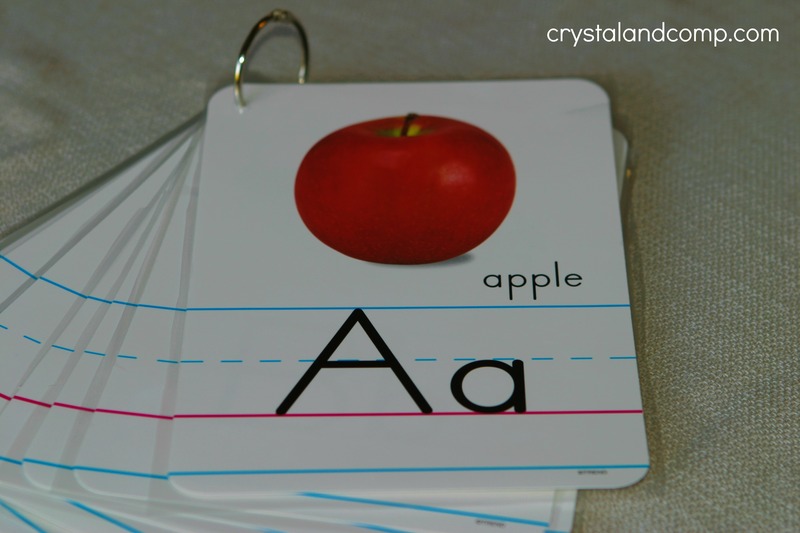 Are you and your preschooler going over the alphabet together? Are you taking it one letter at a time? This is what I am doing with my little Matthew (4) as he learns his ABC’s. We are calling it the letter of the week . Right now we are learning the letter Cc. 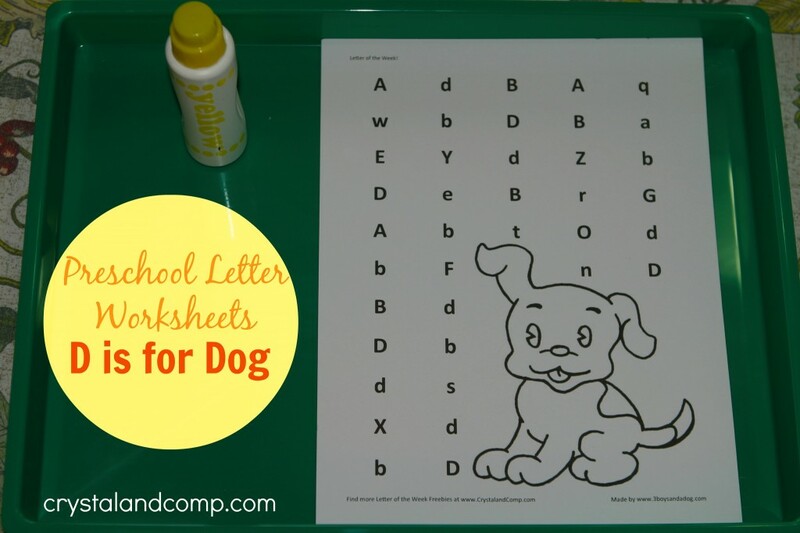 Each week I am sharing with you new preschool letter worksheets that go over the letter we are learning. These printables go perfectlywith our letter of the week crafts, best children’s books listings and snack ideas. 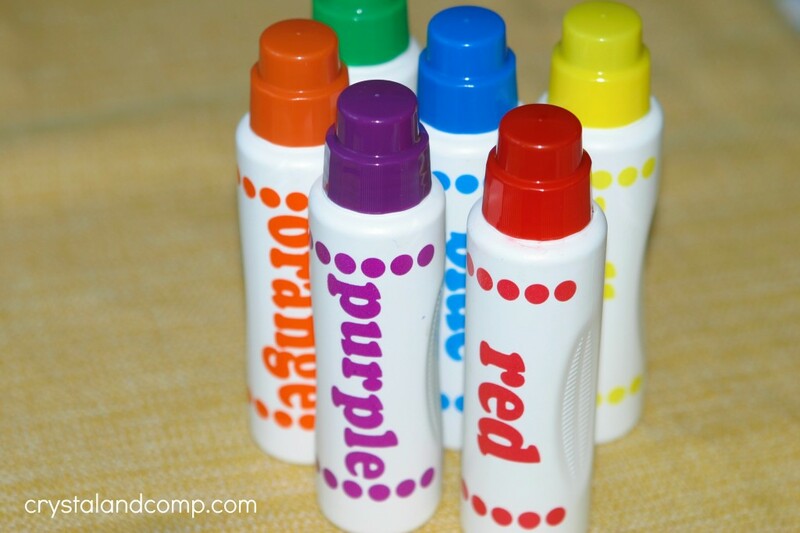 Have you ever seen do-a-dot markers? Oh man, your little kids will love them! 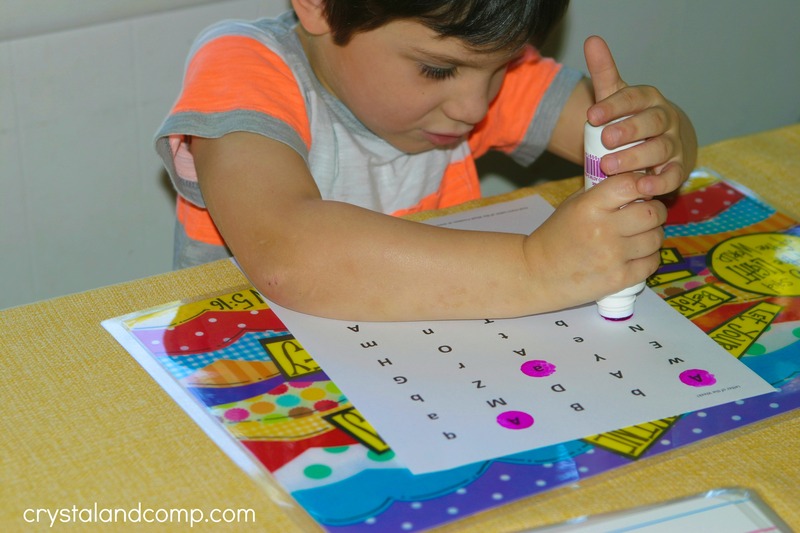 They resemble “bingo dobbers” and they work perfectly for these find a letter printables. C is for car. 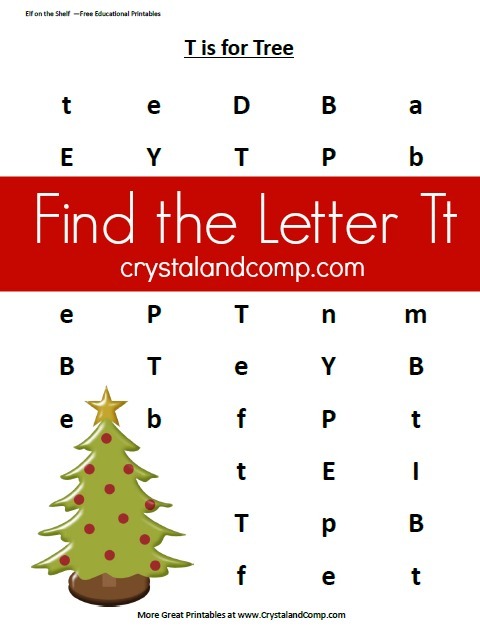 Let’s find all of the big C’s and little c’s! 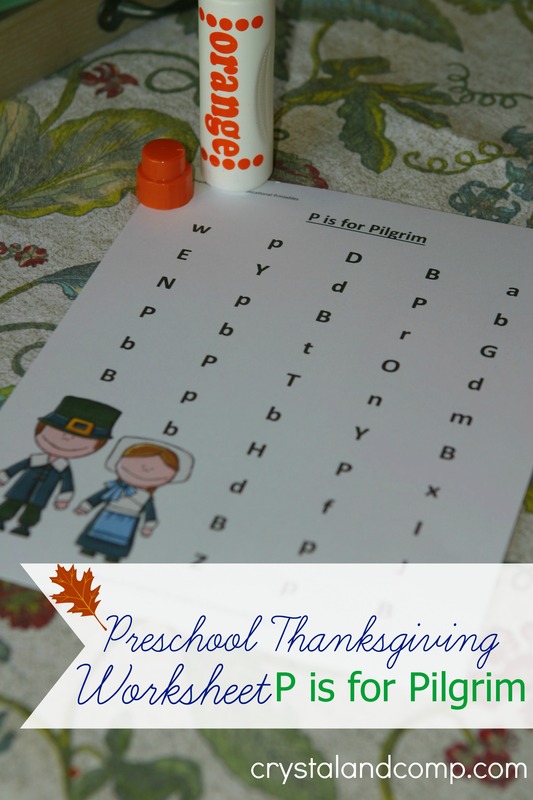 Print out your free letter Cc printable. 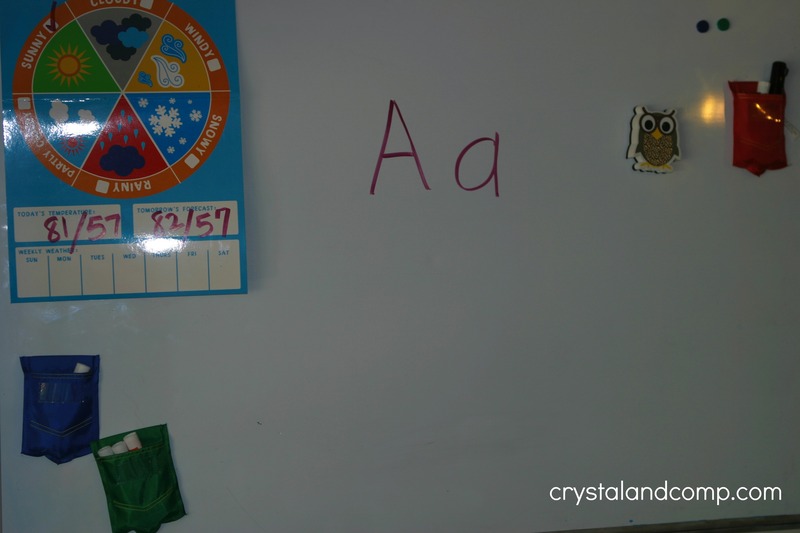 I like to write the letter Cc on my dry erase board. This board is mounted on the wall in our dining room right next to our kitchen table. This is where the majority of our homeschool day takes place. I get out our alphabet flip book and we find this week’s letter. I made this flip book on the cheap and you can make one too! A link to the simple tutorial is at the end of this post. We say the letter, we say the picture and we say the sound the letter makes. Matthew was so proud of himself for doing this. When I first made this book a few months back, he had no interest in learning or saying the sounds each letter makes. He went through and quickly identified all of the C’s. He used his do-a-dot marker to mark each one. By this time 0ur dog had hopped up next to Matthew. 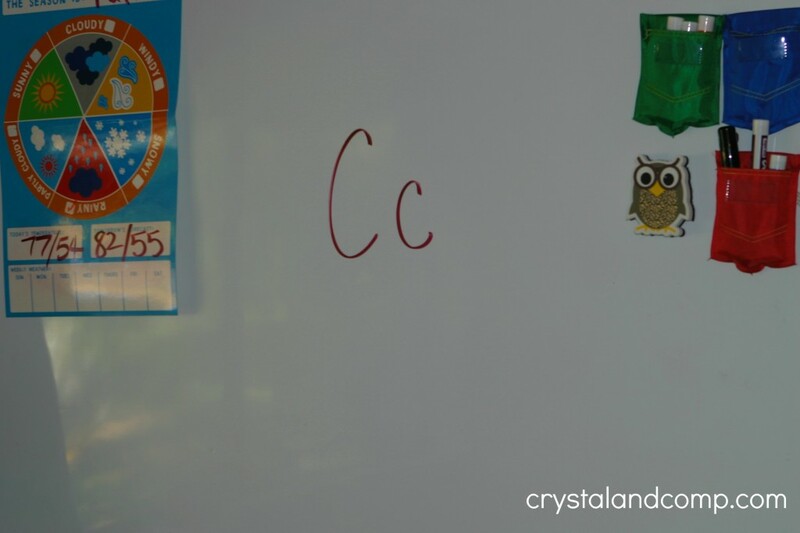 Matthew counted how many C’s he had marked. The dog listened. Right now Matthew is learning how to write his name. I am on the hunt for name practice for preschoolers. 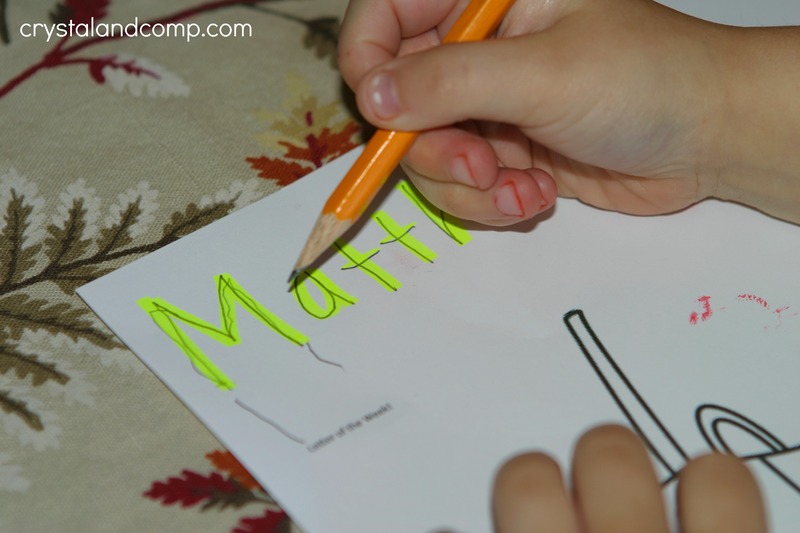 I took this opportunity to utilize the free space on this printable for Matthew to work on tracing his name. 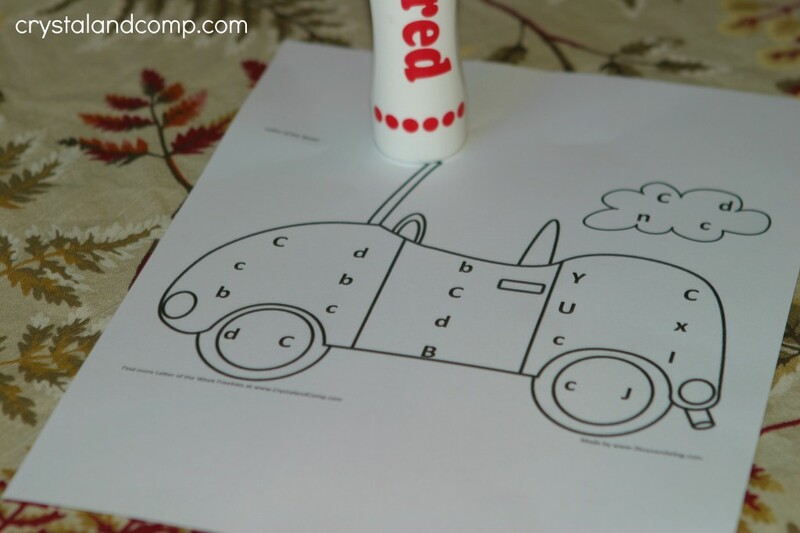 Another fun thing you can do is give your preschooler crayons and let them color the car as you talk more about the letter Cc. 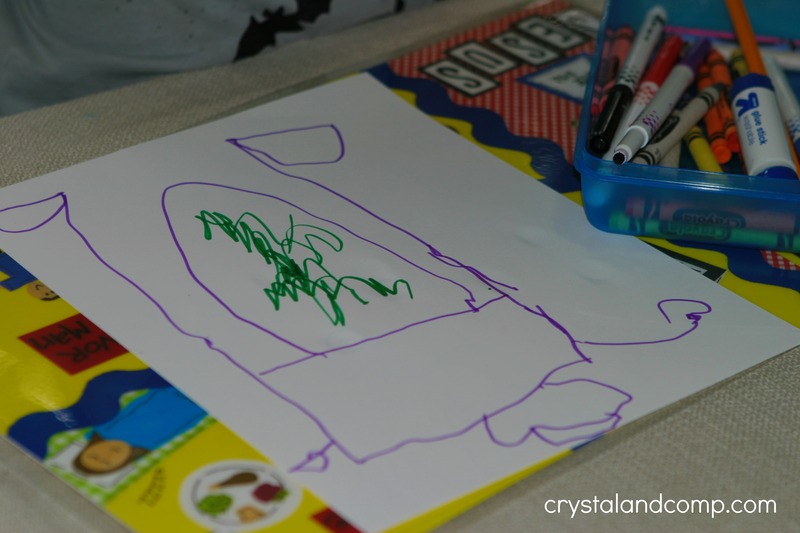 Do you love teaching your preschooler at home? 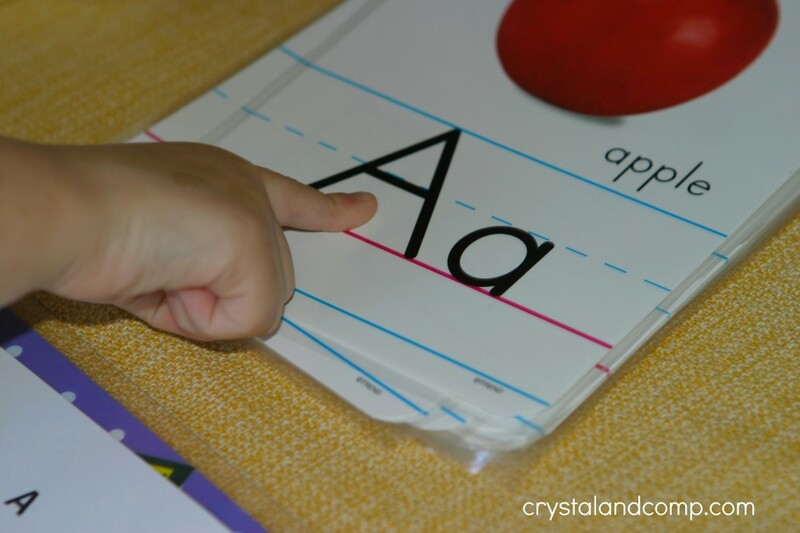 Are you doing letter of the week crafts as your little one learns their ABC’s? 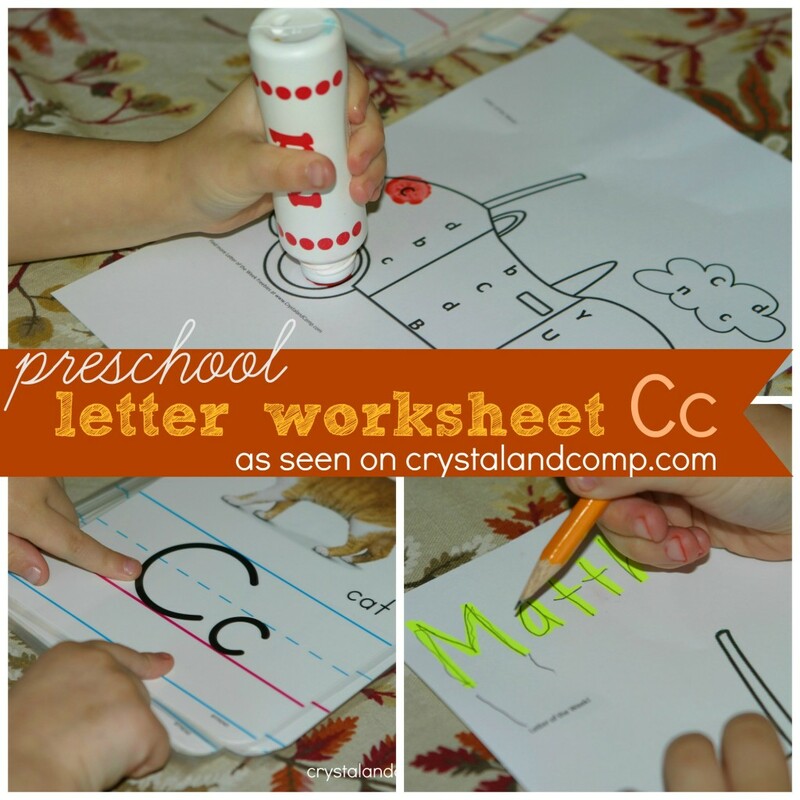 Last week I started sharing preschool letter worksheets with you guys that you can print for free. 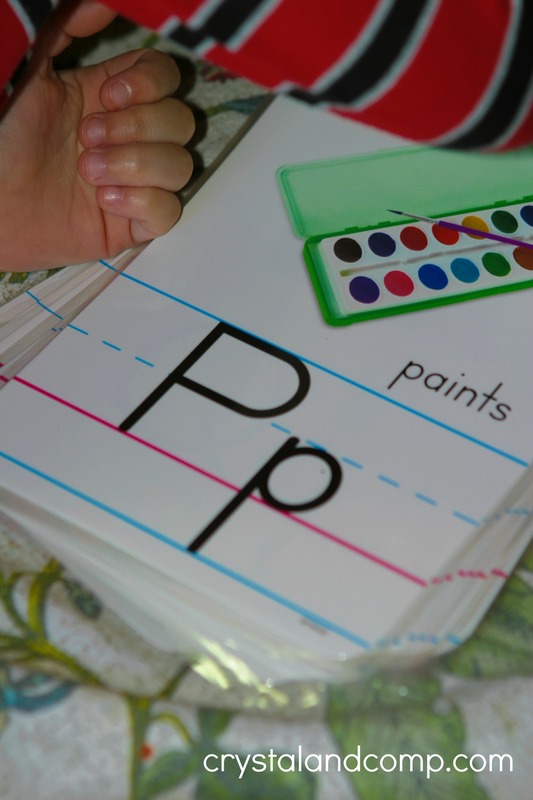 Each worksheet focuses on a new letter of the alphabet and ties in perfectly with our letter of the week crafts. 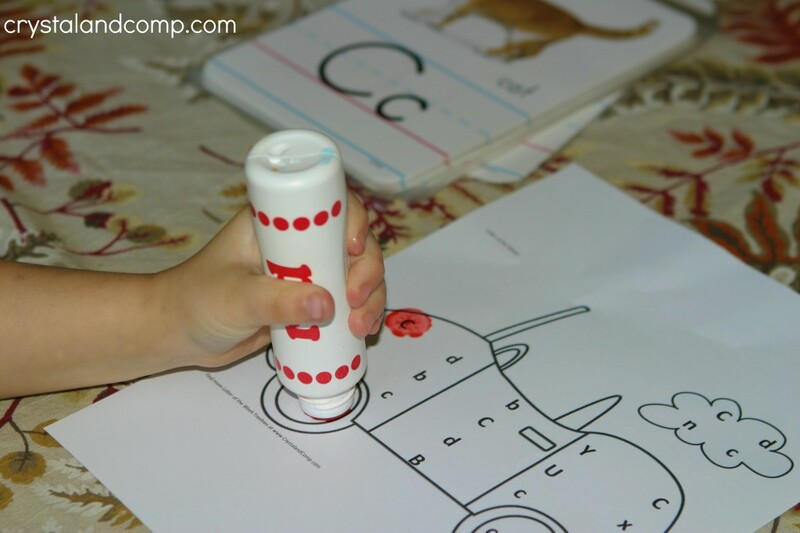 Your preschooler uses do a dot markers to identify the letter of the week that you are working on. 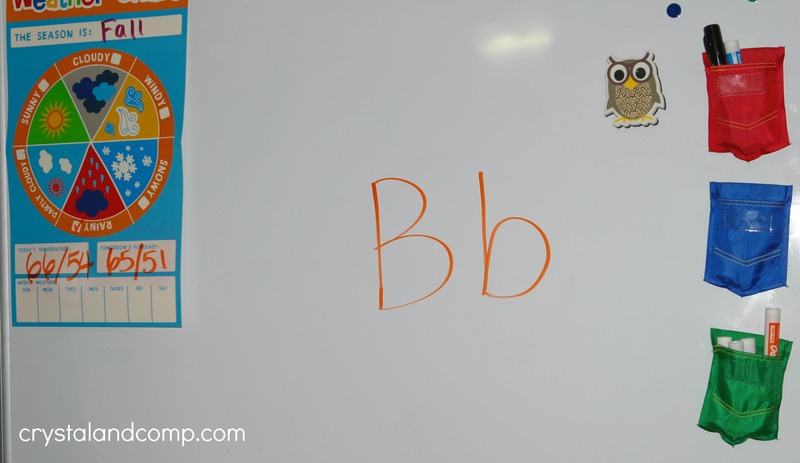 This week our worksheet focuses on the letter Bb. 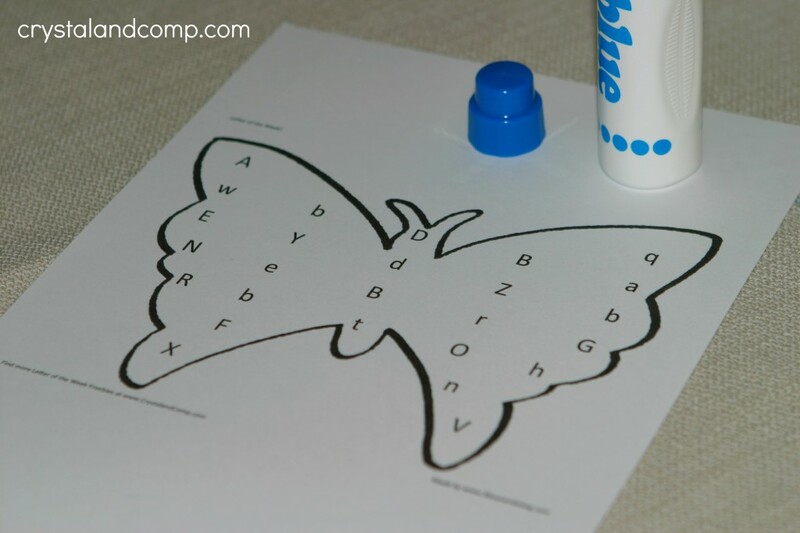 What better way to do this than to tie this printable in with our B is for Butterfly preschool craft and B is for Butterfly snack idea?! 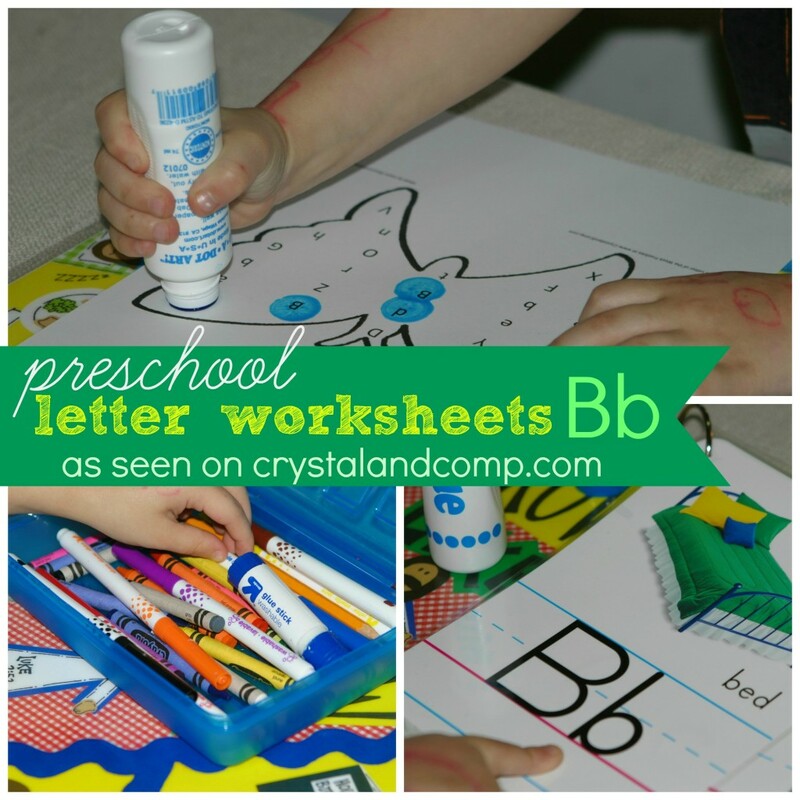 Print out your free letter Bb printable. Discuss the letter Bb and the sound it makes. 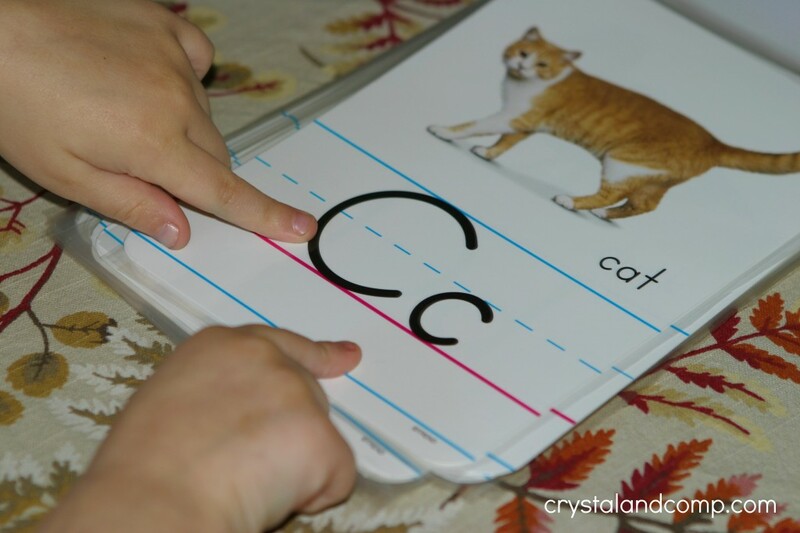 Show them how to write the big B and little b on a dry erase board, chalk board or piece of paper. Say the sound it makes. 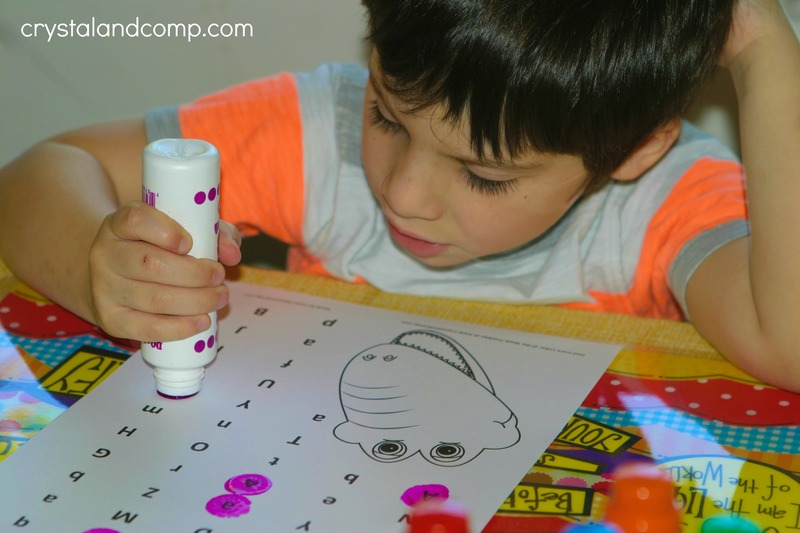 Let your preschooler use the do a dot markers to find the big B’s and little b’s on the printable. 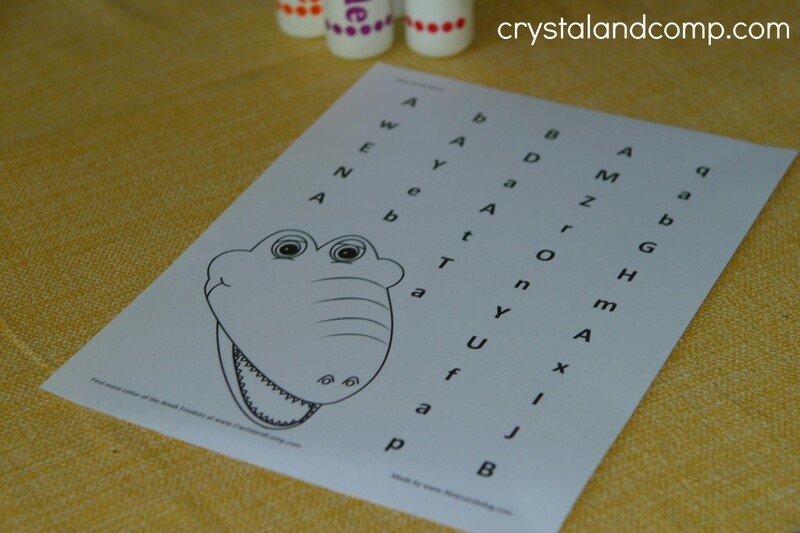 Matthew (4) was able to identify big A’s and little a’s from last week on this printable. Matthew did mark some of the wrong letters today- like p, q and d. But that is ok. Talk about the mistakes and how they look different from Bb. Break out the crayons and/or markers. Let them color the butterfly. 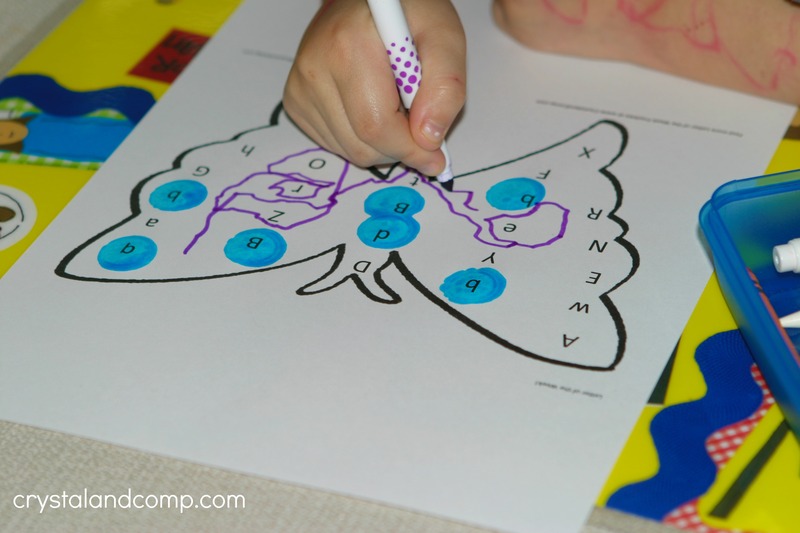 Instead of coloring the butterfly, Matthew wanted to trace around the letters like it was a maze. Have at it. Let them be creative. 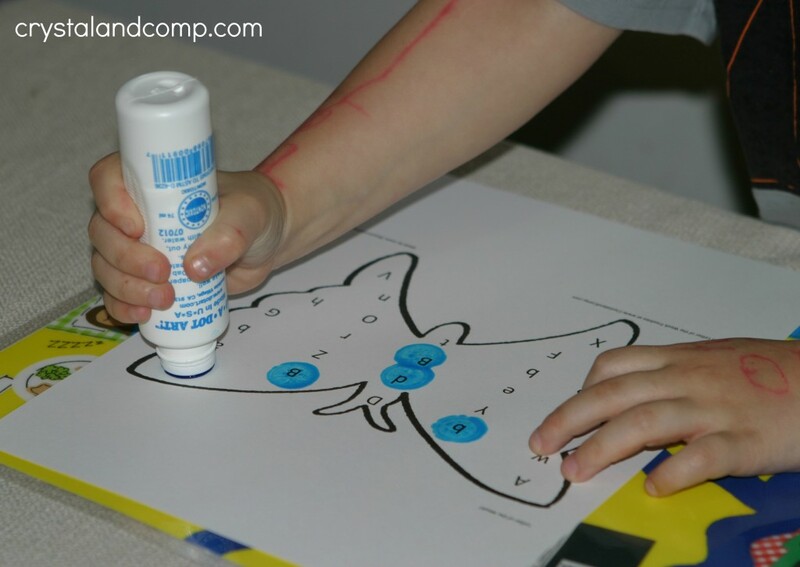 For a preschooler who has more developed scissor skills, you could certainly let them cut the butterfly out after they color it. There is also space, if you choose not to cut the butterfly, for your child to practice writing their name above or below the butterfly. Matthew wanted to use the back of his paper to draw a robot. I loved watching him be creative. Really, it is about having fun while learning and making memories together. My older kids like to give their input on Matthew’s work as well and they like to coach him along. I love that it can be a family effort.